Everything from the sights and the sounds, the food, the feel of the air, the atmosphere, the people; I think I really crushed hard on Japan during those two short weeks and now that I’m back it’s really hitting me in the feels! Nevertheless though, I’ve been pretty busy here, at work and at home, as I slowly readjust to my everyday life. What I want to share with you all today is a little project that I couldn’t share with you before leaving for Japan, and that would be this little cute Camilla baby Blanket. You see, one of my Japanese penpals, Eriko, is currently pregnant and since she was kind enough to spend two days showing me around Kyoto and Osaka, I wanted to bring her a little something special for her little-one-to-be. So a couple weeks before my trip, I started this cutie little blanket for her using the three skeins of Brown Sheep’s Cotton Fleece that I had on hand. Since I don’t know whether the baby is a boy or a girl, I figured a neutral blueish gray would be fine. Since I’ve already bought the Camilla Pullover pattern in the past, I did not buy the actual Camilla Blanket pattern but instead used the instructions for the fan pattern from the pullover that I first converted to RS/WS instructions, repeated 4 times and added a garter stitch border on the top, bottom and edges. The finished blanket is about stroller size, measuring about 30″X32″. Since I was using a Worsted weight yarn instead of Aran, I worked the blanket on 5 mm needles instead of the recommended 6.5 mm. I don’t work very often with needles over 4 mm, so I took advantage of this opportunity to try the Kollage square needle that I had received as a sample a couple years back but never got a chance to use. Although I was a bit skeptical at first, I must admit that I was actually quite pleased by the grip and the feel of those square needles, and it felt very natural to use. Actually, I enjoyed working with it so much I think I might seriously consider getting them in other sizes, or maybe even by the interchangeable set. All the details, save for the actual fan motif, can be found on my project page so feel free to check it over if you’re interested. This entry was posted in Knitting and tagged art, baby, baby blanket, blanket, craft, crafting, family, fan, friends, inspiration, knit, knitting, lace, love, motif, needle art, needle arts, needle craft, passion, texture, wave. Earlier this summer, one thing led to another and I ended up spending a week of vacation in Hawaii. Yep, one beautiful week in a pacific paradise. Let me explain how things came to be. Honeybee and I are/will be Ohio-bound a bit more this year for family reasons (family reunion in July, his sister’s wedding in October and Christmas). Consequently, all his vacation time this year was dedicated to spending time with his family in the midwest, and not much was left for anything else. I’m lucky enough to be allowed a bit more vacation time but since I he doesn’t have any more, I didn’t really know what to do with the left over week I had. I finally opted to place that week off on my birthday, so from August 27th do September 2nd but for the longest time I thought I was simply going to stay home. Somehow though, the thought of being home alone on the week of my birthday while Honeybee was working was making me a bit depressed, so I started looking for places to go or things to see. And finally, one week prior to my vacation, I stumbled on a 600$ plane ticket to Hawaii. Yep. That’s what happened. I am still amazed at what I saw and experienced there, and to this day I still do not understand why the entire population of the US still hasn’t moved to Hawaii yet… Because I would if I could. In other news though, I did take advantage of my week off to finish a cutie little white cotton blanket for little baby Damien who will get baptized in October. I used 3 full skeins of Berroco Modern Cotton DK, and it’s just so luscious and soft I could bury my face in it all day! I might write this pattern out in the next couple months with different yarn weight/gauge and size options, so keep an eye out for that. This entry was posted in Crafts, Knitting, Slice of life and tagged aloha, baby, beach, blanket, craft, gift, hawaii, knit, knitting, lace, pacific, panorama, passion, photo, photography, sun, travel, trip, tropics, vacation. For 3 or 4 weeks now, Honeybee and I have been living in complete chaos in the house because I decided to undertake a major project – painting the kitchen. This may seem like a menial task for some of you, but I can assure you that we have experienced anything but. Thing is, our kitchen isn’t very big but it’s packed, the cabinets are painted and the entire room is nothing but corners, trim and moldings (ceiling included!). Add to that the fact that we just bought a giant 80” long kitchen table and that I opted for a 3 color scheme for the walls&ceiling and you’ll quickly understand it was simply impossible to paint everything at once so I’ve had to proceed in sections, moving the furniture and the stuff as I go so it’s been slow but steady progress in the last few weeks. I still have to paint the cabinets but things are working out fine, and I’m really excited to see it come together. Since we’ve been painting quite a bit at home recently (we’re on our third room being painted since this fall) my craft room has been doubling as a storage room for quite some time now, so we could get the furniture out of the way while we were working on the other rooms. Since things are finally starting to clear up a bit, I’ve had a chance to tidy things around in this room for the first time in months, and I took this opportunity to use up some small fabric remnants or finish projects I started a very long time ago. There’s also a cute little lunch bag with a bee cotton print and a large, reversible tote bag made using the Kwik Sew pattern K3700 and some remnants I had in stash. This tote has a really nice shape and feels nice on the shoulders, and the pattern is actually really cool because it provides instructions to build these bags directly on a serger, both with apparent and hidden seams. I also made a couple new placemats to fit into the new kitchen and the fabric might give you a hint as to which color I’ve used to paint a portion of the walls. I’ve actually had the fabric cut and prepped for those placemats for so many years now because it was left over from a set I made for my dad and his wife. I made them a set of 6, but there was fabric left over for 2 more placemats, that I never sew together because I didn’t want to offer someone an incomplete set. Since there’s only me and my husband at home right now though, I figured I might as well give it a shot, especially since the leafy green fabric is so pretty! This entry was posted in Sewing, Slice of life and tagged art, baby, baby wrap, bag, craft, creativity, fabric, green, life, passion, placemats, quilting, sew, sewing, stripes, tote. My very best friend just recently had a baby so I’ve been on a rampage gathering all sorts of baby-related patterns and things, and let me tell you that it is candy for the eyes! There are so many cute, adorable baby things out there, it’s like a knitter’s paradise! This is the very first time I’ve ever knitted a plush toy, and it was so much fun that I can foresee many-a-plushie for me in the future. The yet-to-be-named little monster (or Hugo the couch potato monster, as referred to by the author) was an easy, quick and fun knit, that provided lots of instant gratification and allowed me to combine two (otherwise unusable) small 50g skeins to create a unique, playful and soft toy for someone’s special little person. In this case, I used a little over half a skein of blue Malabrigo Silky Merino yarn and ¾ of a skein of gray Louisa Harding Grace Silk & Wool yarn, leaving some room for (maybe!) another smaller monster in the same color palette. Who knows? Looking through the book, I fell in love all over again with all those adorable monsters and I can tell you that there might soon be an Angus the Attic Monster, an Irving the Icebox Monster, a Dot the Dress Up Box Monster or a Bea the Basement Monster in the works. Hurray for babies (and plushies)! This entry was posted in Knitting and tagged adventure, art, baby, blanket, boy, buttons, craft, crafts, fiber, gift, knit, knitting, lace, merino, monster, monsters, needle art, needle arts, needle craft, passion, plushie, rebecca danger, silk, stripes, the big book of knitted monsters, toy, wool, yarn. 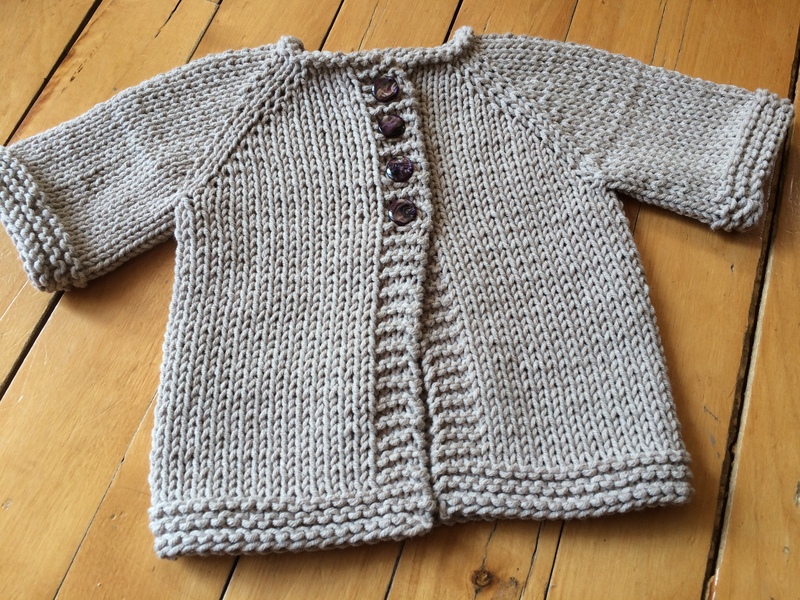 My friends, I am so happy to announce to you today that I have finally finished my Stellata Cardigan! Yes! It looks great and it feels amazing, as I predicted. So… I am definitely going to wear the heck out of this one this summer! The yarn I used is Elsebeth Lavold Hempathy in color “peach”. Now that I’m done, I can definitely say that I LOVE this yarn. I will be using it again… Surely! It’s soft, comfortable and airy, and it also knits up like a charm. If you have not used it yet, I definitely recommend it for any summer garments! Amongsnt other things, I also completed a very (tiny) project for a little human in the making, who is supposed to be born sometime this summer. I used a cotton/acrylic blend so it’s not too hot and also easy to wash, the yarn is DungarEase from Knit one Crochet Too. I picked the color “Sand”, which I thought was perfect for a baby who’s gender you do not know yet. So what have you Sweeties been up to lately? This entry was posted in Knitting and tagged art, baby, cardigan, cotton, craft, hemp, knit, knitting, linen, needle art, passion, peach, sweater.